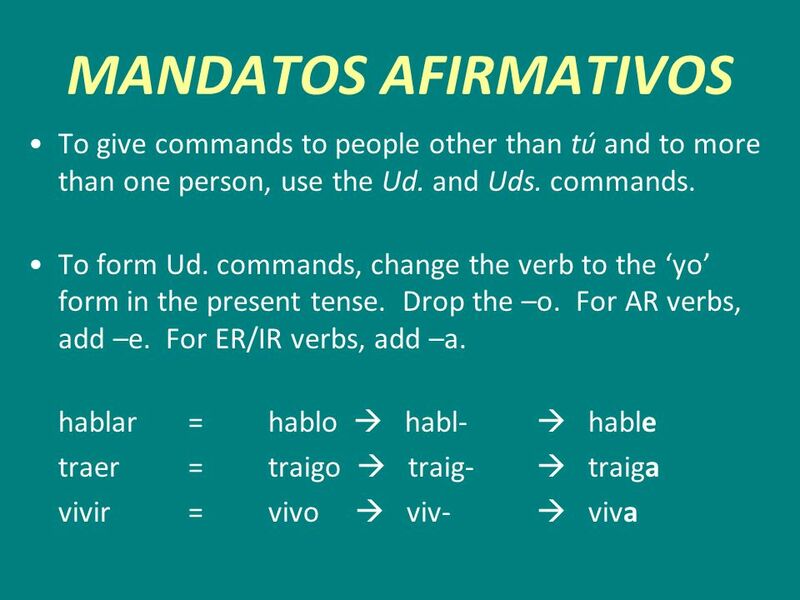 4 MANDATOS AFIRMATIVOS Attach reflexive, direct, and indirect object pronouns to the end of affirmative commands. 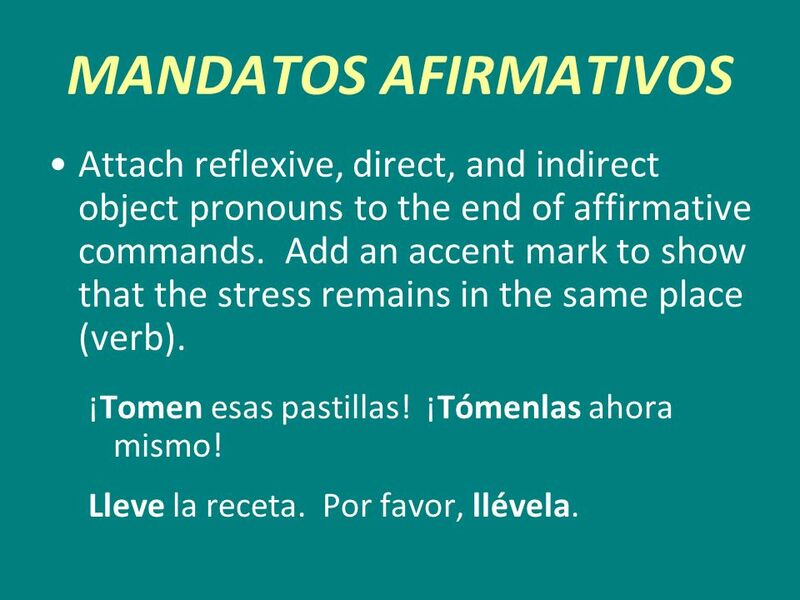 Add an accent mark to show that the stress remains in the same place (verb). ¡Tomen esas pastillas! ¡Tómenlas ahora mismo! Lleve la receta. Por favor, llévela. 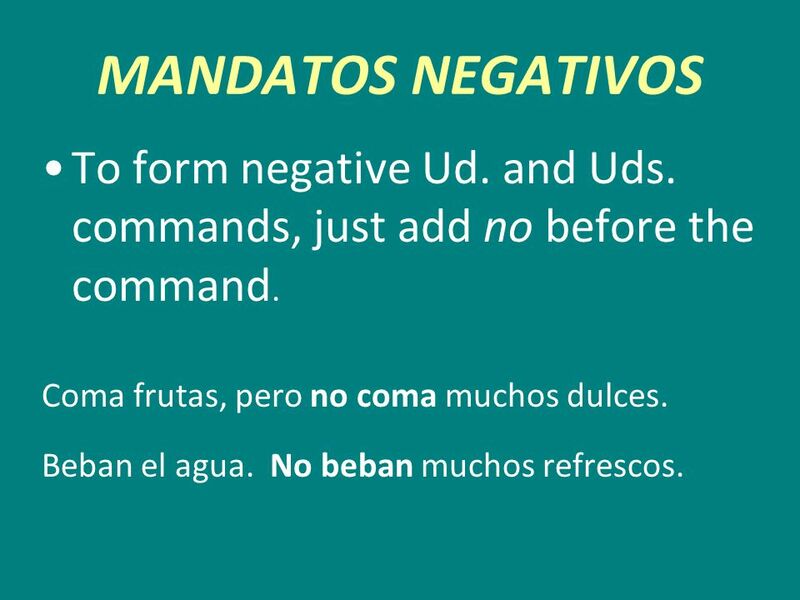 5 MANDATOS NEGATIVOS To form negative Ud. and Uds. commands, just add no before the command. Coma frutas, pero no coma muchos dulces. Beban el agua. No beban muchos refrescos. 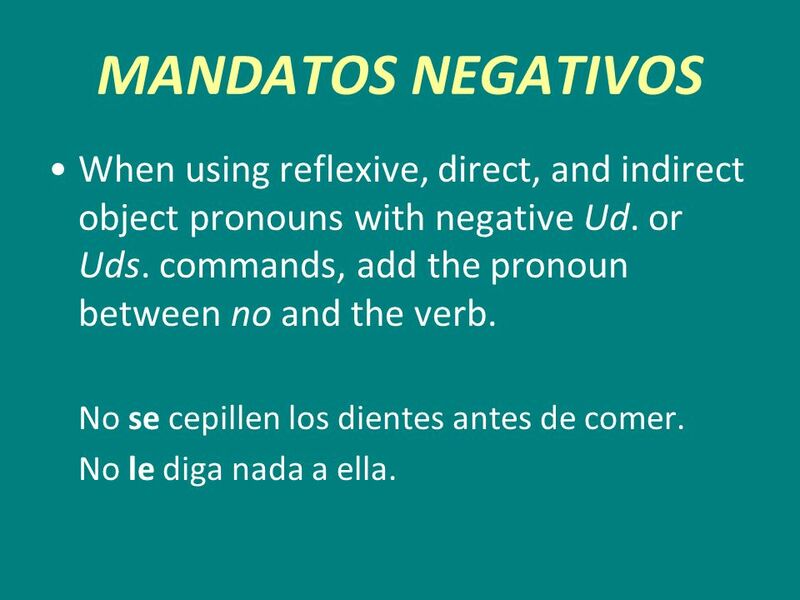 6 MANDATOS NEGATIVOS When using reflexive, direct, and indirect object pronouns with negative Ud. or Uds. commands, add the pronoun between no and the verb. No se cepillen los dientes antes de comer. No le diga nada a ella. Descargar ppt "Formal/Ud. y Uds. 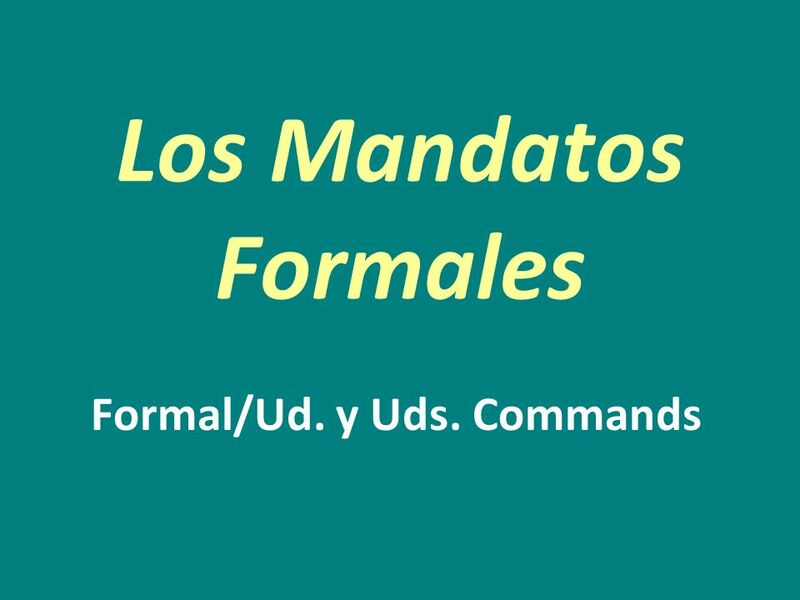 Commands"
Para empezar Hoy es martes el once de dieciembre Escriba mandatos informales positivos con los verbos en oraciones completas. Modelo- Hervir--> Hierve. Usted Commands. Formal Commands Are used when you are speaking to someone who is older than you. Used as a way to be polite and show respect. To tell a friend or close family member to do something, use the tú command form. 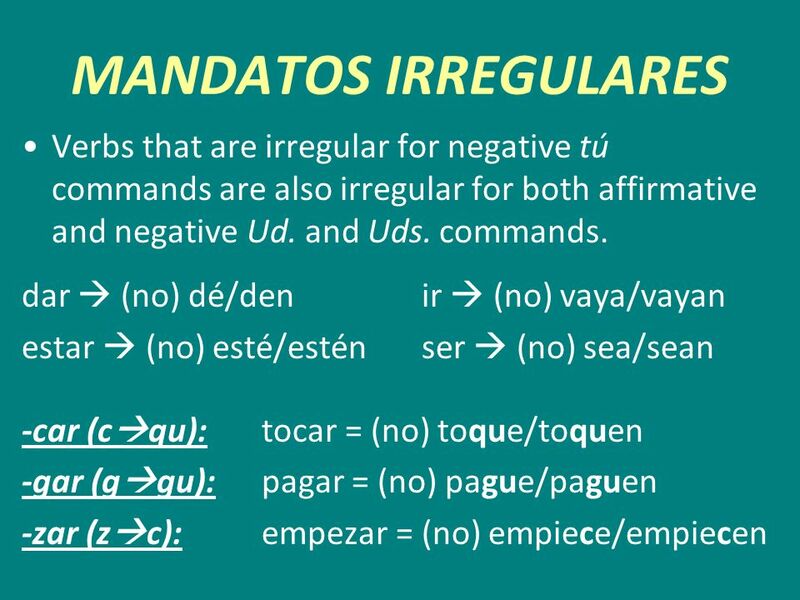 To give an affirmative command in the tú form, use the present indicative. 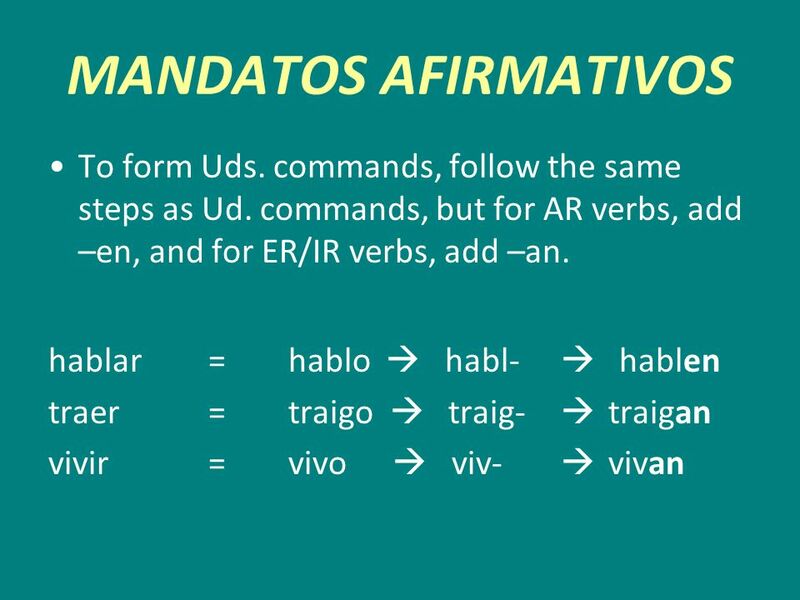 Los Mandatos Affirmative (+) tú. ¿Cuál es la diferencia? 1.Juan come el desayuno. Juan eats breakfast. 2.Juan, come el desayuno. Juan, eat breakfast.